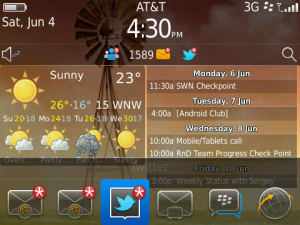 Personalize your home screen with Fancy Widgets for BlackBerry! BlackBerry users are all about customization. Be it with wallpapers, ringtones, themes, or apps, there are countless ways to go about making your BlackBerry reflect who you are. Another way this can be done that is usually not the first thing that comes to mind on this platform is through widgets. While not a native function of BlackBerry at this time, you can still have widgets on your home screen with the help of applications such as Fancy Widgets, which we first showed you back in December. Packed with options, this application will replace your current wallpaper with the widgets you choose. Don't worry if you are a wallpaper fanatic though; one of the included options is a wallpaper changer. You can add widgets such as stocks, weather, quotes, countdown, Twitter, and RSS feeds, and place them wherever you want. If you switch themes often, this is a key feature as you can reposition, add, and remove widgets as needed. You can even save and load previous profiles to save time! BerryWeather is supported as well, which I know is huge for a lot of you out there. The latest version of Fancy Widgets is v1.2.4. This version has brought some worthwhile updates, so if you haven't checked it out yet it's a good time to do so! You can download the free version which gives you access to just two widgets, or get the full version for $2.99. Improved Clock Widget. It is now Digital Clock. Supports custom fonts.